More than anything, Joel wants to be a Rithmatist. Rithmatists have the power to infuse life into two-dimensional figures known as Chalklings. Rithmatists are humanity's only defense against the Wild Chalklings. Having nearly overrun the territory of Nebraska, the Wild Chalklings now threaten all of the American Isles. 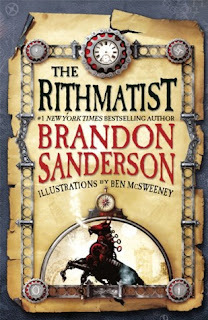 As the son of a lowly chalk maker at Armedius Academy, Joel can only watch as Rithmatist students learn the magical art that he would do anything to practice. Then students start disappearing - kidnapped from their rooms at night, leaving trails of blood. Assigned to help the professor who is investigating the crimes, Joel and his friend Melody find themselves on the trail of an unexpected discovery - one that will change Rithmatics - and their world - forever. I had no idea that Brandon Sanderson was super popular. And then I went to YallFest last year and was mesmerized by the long line of people waiting to get his autograph. So I returned to my library and checked the circulations. Nope. The craze hadn't hit Greenwood yet. And then BOOM everything started checking out. Why? Well, I'm not quite sure. Maybe it just took a little extra time for word to spread throughout the Heartland, but I had to check it out for myself. This particular title was recommended to me by a teen who assured me I would like it. He was not wrong. I did like it. It didn't knock my socks off or leave me scampering to get my hands on another Sanderson title immediately, but it was imaginative, intelligent, and complex enough to keep me reading. It's America...but not really. What we know as states are islands, and on one particular island are wild chalklings, magical line drawings waging war against trained soldiers known as Rithmatists. Rithmatists can create wards and creatures of their own (made of chalk), and their sacrifice is helping keep the other islands safe. Joel wants desperately to be a Rithmatist, but he wasn't chosen by "the Master" at the age of 8, so he is just a ho-hum regular boy studying at a prestigious academy, the custodians son among rich socialites. When some Rithmatist students are violently kidnapped, Joel uncovers a dangerous conspiracy that puts him in the middle of the magical world. I liked Joel's tenacity and loyalty. While life had not turned out as he might have hoped, he continued moving forward, finding ways to study Rithmancy without abilities. He utilized research to better understand. He was a scholar. A student. And it was refreshing seeing a teen protagonist take that seriously. There is also a strong message about power, courage, and teamwork throughout that I really enjoyed. Like Harry Potter, the "magic" was secondary to the characters and their mission. Four years is a long time to wait for a sequel. Hopefully the Goodreads note that it's coming in 2017 is correct. If there's time, maybe I'll try to tackle another Sanderson soon.